Over the past few weeks, Rudi Garcia’s fantastic start as Roma manager has been overlooked, laughed about, or simply ignored. Unlike last season, when Zdenek Zeman’s tenure was highly anticipated, Garcia’s was closely critiqued – at some points harshly ridiculed. But as we embark upon the second international break of the season, Garcia’s men has silenced more critics, and remain undefeated at the top of the table. This weekend it was Walter Mazzarri’s Inter Milan that provided another obstacle for Roma to overcome. The Giallorossi produced a mature performance at the San Siro, combining defensive organization with quick transitions on the counter, to keep their unbeaten record intact. And it was their two-standout performers this season – Gervinho and Totti – that were brilliant on the night. Francesco Totti continues to look ageless in Roma’s 4-3-3, which arguably is a 4-6-0 due to the Italian’s tactical intelligence. Totti is not your typical conventional striker – he drops deeper into midfield searching for space to receive the ball, allowing his wingers to attack the space behind him. 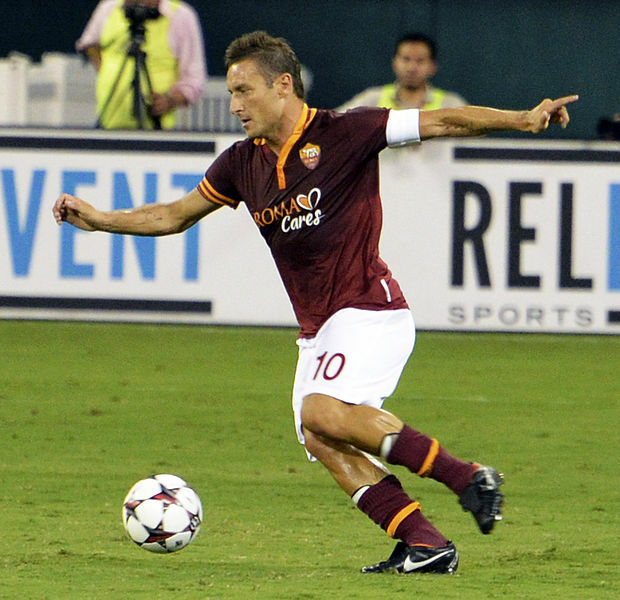 Nonetheless, it was Totti who led the cavalry to three points with a first half brace. 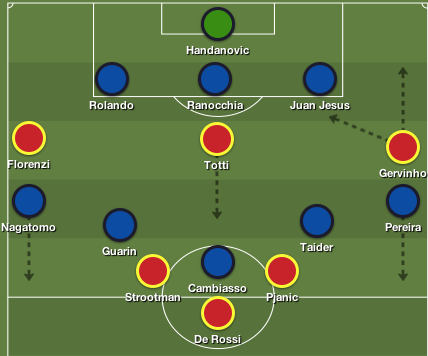 However, Roma’s goals stemmed from Garcia’s initial game plan – defend deep and get the ball to their wide players . The Giallorossi pounced on Andrea Ranocchia’s failed clearance, and Alessandro Florenzi played a pass to Gervinho, who laid the ball off for Totti to thump a fabulous strike past Samir Handanovic. Totti added to his tally from the spot 20 minutes later, courtesy of Gervinho’s direct threat from wide areas, which led to Alvaro Pereira fouling the Ivorian in the box. Florenzi put the match out of reach in the 43rd minute, which showcased a brilliant counter-attack straight off the training ground. Totti cleared his lines, playing a ball towards the advancing Kevin Strootman, who drove through the heart of the Nerazzuri midfield – the Dutch midfielder slid the ball into Florenzi, who hammered a one-time shot into the far corner. For all of Roma’s attacking threat on the counter, their defensive work was equally impressive. Inter was allowed to dictate possession as Roma dropped into their shape, but Mazzarri’s men were unable to get behind the Giallorossi backline. The midfield trio of Daniele De Rossi, Strootman and Miralem Pjanic did a great job in minimizing space between the lines, while maintaining a compact shape ahead of the back four. Inter relied on width from their wingbacks, but Florenzi and Gervinho worked diligently to nullify Pereira and Yuto Nagatomo’s threat from wide areas. As Inter Milan pushed forward looking to find a goal, Gervinho became Roma’s biggest threat going forward. The Ivorian was the main outlet going forward confidently skipping past defenders, as he was a nuisance from wide areas – which was a rarity in his overall game during his time at Arsenal. Gervinho and Totti completed the most passes in the attacking third of any player in a Roma shirt, as Garcia’s men stifled Inter’s attack, an targeted the space available on the counter. Roma produced another terrific performance against an Inter Milan side that were on a great run of form, prior to the result. Last season the Giallorossi were abysmal at the back, and would’ve struggled to maintain a three-goal lead, but Garcia’s men – who have only conceded one goal thus far – continue to be magnificent defensively. It’s uncertain as to whether Roma will be able to sustain such brilliance for the duration of the season, but it’s refreshing to hear the Giallorossi mentioned in the title conversation.